Covered bridges. Gracious inns. Historic and picture-perfect farms. Art galleries. A national park. An approachable ski mountain with slopes for all abilities. An oblong Village Green where farmers and artisans sell homegrown and handmade goods on Wednesday afternoons in the summer and fall. 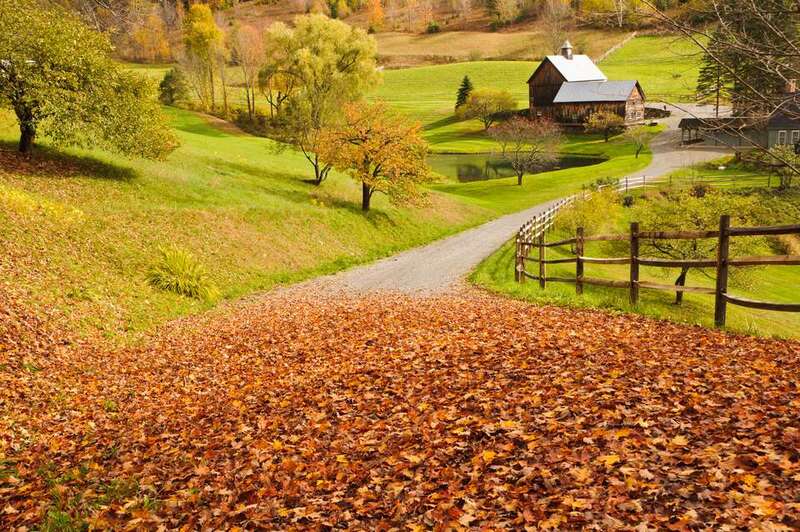 Woodstock, Vermont, may be a petite town with a population that barely tops 3,000, but this popular destination on the eastern side of the state has every element you'd expect if you're dreaming of a quintessentially Vermont getaway. Here are some of the best attractions and things to do in Woodstock, VT. One thing you won't find: Starbucks. Just about 15 minutes south of Woodstock off Route 106 lies a scene that may appear instantly familiar. Jenne Farm at 1264 Jenne Road in Reading, VT, is widely believed to be New England's and perhaps even the nation's most photographed farm. Train your lens or your smartphone's screen on this photogenic landscape, and you'll capture a shot amateur, professional and even Hollywood photographers and filmmakers have been drawn to for years. Billings Farm is a place to explore the evolution of agricultural practices in Vermont while also stepping behind the scenes of a commercial dairy operation. It's also an incredibly fun place for kids to experience farm life in interactive, hands-on ways. The farm, which Frederick Billings purchased from Charles Marsh in 1869, has been a public attraction for more than 30 years. With a resident herd of more than 60 fine Jersey cows, this still-working farm offers daily programs that allow kids to observe and appreciate farm animals like chicken and sheep and to try such chores as butter churning. The Woodstock Inn & Resort's Suicide Six ski area in South Pomfret, VT, has a storied history. One of the earliest lift-serviced hills in New England, Suicide Six may have only 24 trails, but there is terrain suitable for all abilities, from beginners to experts. The ski area is open to the public and accessible via a free shuttle from the Woodstock Inn & Resort. Adult guests of the inn ski free midweek and kids ski free every day. Serious skiers staying in Woodstock will find big mountain thrills just 25 miles away at ​Killington. It's been more than three decades since Irish designer Simon Pearce crossed the pond and set up his workshop in an old textile mill down the road from Woodstock in Quechee, Vermont. The Mill remains a must-visit attraction, where you can observe glass blowers and other artisans at work producing Pearce's distinctive pieces. Make reservations to enjoy lunch, dinner or Sunday brunch at the acclaimed restaurant on-site, which serves fare prepared with local ingredients on exquisite Simon Pearce china with views overlooking Quechee Covered Bridge and waterfall. Laurance S. and Mary F. Rockefeller gave Vermont -- and the nation -- an incomparable gift: their home in Woodstock, Vermont. The Marsh-Billings-Rockefeller National Historical Park was established in 1992 and opened to the public in 1998, and it's a fascinating place to visit if you love art, history, environmentalism or the outdoors. George Perkins Marsh, one of the first Americans to articulate ideas about conservation, grew up on this property, and his philosophies were embraced and put into practice by equally passionate land conservation advocate Frederick Billings, who purchased the estate in 1869. The Rockefellers, final owners of these 550 acres, insisted the house where they summered be kept just as they left it, complete with their remarkable art collection. Woodstock claims three of Vermont's 100+ covered bridges. Middle Bridge, which you'll find on Mountain Avenue across the Village Green from the Woodstock Inn & Resort, is actually a fairly modern structure built in 1969 in authentic covered bridge style. Head three miles west of the Village Green on Route 4 to view historic Lincoln Bridge, which dates to 1877 and is the country's sole Pratt-type truss bridge constructed of wood. Taftsville Bridge sits 4 miles east of the Village Green on Route 4. Vermont's third oldest covered bridge, which was originally built in 1836, had to be extensively restored following 2011's Tropical Storm Irene.